Established by a group of professionals from the academic and business communities in Massachusetts, the Pirandello Lyceum exists to provide accurate accounts of these contributions for the international, and particularly American community. Its activities and purpose have been recognized with support from the Massachusetts Council on the Arts and Humanities, the Massachusetts Foundation for the Humanities and Public Policy, the Consulate General of Italy, and private contributors. It is a non-profit tax-exempt organization. Its scholarship program is a catalyst for young people of all ages, colors or creed to benefit by an Italian experience during their educational process. View 2012 Awards. Its award program recognizes those Italian/Americans who continue to make significant contributions to society “in the spirit” of Luigi Pirandello. View 2013 Awards. Its duty and responsibility to monitor the depiction of Italian Americans is to insure the accuracy of reporting their contributions, while eradicating stereotyping of all forms. 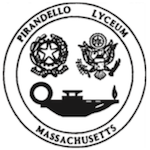 The Pirandello Lyceum is a non-profit cultural organization under the general laws of Massachusetts. Open to all. Free entrance. Italian with English subtitles. Caffè & Biscotti will be provided. SYNOPSIS: Annetta lives in a small village in rural Sardinia at the end of the 1930s. She is in her mid-30s, always wears black, is a loner and silent, with a flinty beauty typical of the dry surrounds. She holds a terrible secret from the past and spend long days waiting for a call. When it comes, her slim fingers open an old leather bag and reveal a wooden mallet, an old cushion, a broken mirror… until something unexpected happens to change her whole existence… and gradually Annetta will discover that she can be something completely different from the Accabadora (angel of mercy) which she once was, taking back her own life and the fact of being a woman. (Cineuropa.org).